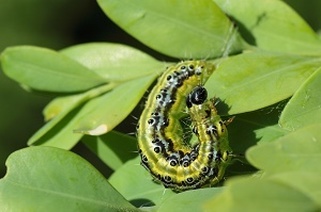 The Royal Horticultural Society has recently named the Box Tree caterpillar as the top garden pest in the UK. Originating from Asia, and migrating into the UK via Europe, this caterpillar is a voracious eater and lives on box plants, favoured as a hedging plant in many English gardens. It was discovered in the UK in 2011 and has been spreading rapidly ever since. Found in London initially, it's encroaching on other parts of south-east England and is causing serious problems. The moth has now become established in our area and its larval form can completely strip a box plant. You'll recognise an attack because the plant will be left defoliated and covered in webbing. Unfortunately the Box Tree moth has no natural predators since birds don't seem to find them tasty and they are becoming a major problem right across mainland Europe.